The Willie Wagtails that were nesting in the big tree next to my house have apparently failed in the attempt. I am not even sure if they had eggs in the nest as it was far too high for me to see. They both sat on the nest for some days and then lost interest. Nevertheless it was an interesting few days as they chased off any larger birds that dared to come into the area. 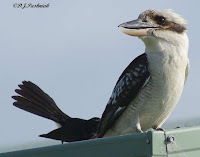 This is a series of photos taken one morning as one of them chased away a kookaburra. 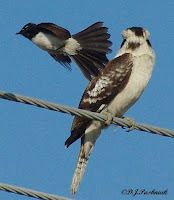 The kookaburra was out the front on the electricity supply lines first. It was soon chased off from there and then flew out the back and perched on the roof of my shed. 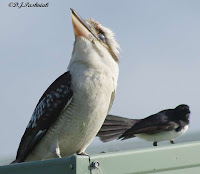 The little Willie Wagtail was just too fast for the Kookaburra which was not even able to keep up with the direction from which the Willie Wagtail would next swoop in. 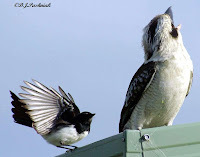 I kept hearing the snap of the Kookaburra's beak as it turned its head and snapped, but by that time Willie Wagtail was usually on the opposite side. All day I have been hearing on the news about the dust storm that hit Sydney early this morning. 4pm and it has just hit here. The news reports are saying that there hasn't been a dust storm like this for 70 years! I've certainly never seen anything like it. I took these photos just now from my yard - the first looking over the back fence past the neighbor's house and the second looking over the hedge on the east side of my place. I don't know why but some weeks there are so many interesting things to photograph and then one tends to get behind in posting! 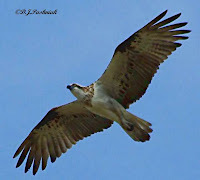 Last week I kayaked with friends over to have a look at an Osprey nest that I have watched for several years. It is a little out of the way so there would seldom be anything to disturb the birds at their nest. This morning there was quite a lot of noise coming from two birds both sitting on top of the nest. I thought at first that it might be young birds making their usual noisy demands of their parents. However, when we got closer we saw that both birds were adult. They flew off the nest and then put on a wonderful display overhead which appeared to be part of a pair bonding exercise. 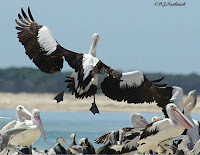 They swooped and soared and went past in a normal flight position and also with their legs and feet extended below them. I am told that sometimes when displaying like this they will even pass sticks between each other while on the wing. There is quite a difference in the patterns and colors underneath the birds which I am also told shows male and female. The female (Hope I have remembered this correctly!) has the darker band around the neck. This post is about two things - the camera and the birds. Now for the birds! Back in June I went for a walk in the rainforest and saw some very tiny birds on the ground hunting around among the fallen leaves. They were small - at a distance I didn't even see them as birds but as creatures not much bigger than a mouse! (I still have a lot to learn about bush birds!) I saw a similar bird out at Inskip hunting around in the leaf litter and got some very dark photos - but enough to get an ID of a White-browed Scrub Wren. So now I knew what they were and where to find them. Then the frustration with the camera really began. I could not get more than a blurred photo of the bird! I really should have spent more time learning about the camera and how to make use of all the settings but I guess it's been better late than never! Yesterday I finally did enough things right to get some OK photos. Not great photos, I know, and I know what to do better next time I see these little fellows scratching around in the leaf litter. Of course, I do wish they would sit still and not decide to suddenly hop up into a really dense shrub. In case I don't see these little birds again for a while (after all I'd rather be out on the kayak!) here are yesterday's photos! This beautiful tree is in full flower right now down the back of my garden. I planted it nearly six years ago and it is the biggest of all the trees in my yard. 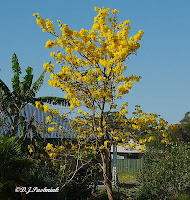 It is a Trumpet Tree (Tabebuia chrysantha) and certainly makes a beautiful show every year. However, it also drops its seeds far and wide and I will spend the next few months pulling out seedlings from all around the back yard. I was certainly not told about this when it was recommended to me in a nursery. This photo is taken looking into my neighbour's back yard. 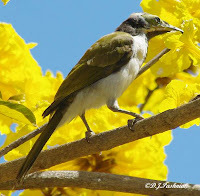 The honeyeaters have been enjoying the flowers too. 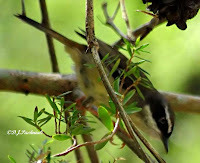 These photos are of a juvenile Blue-faced Honeyeater. The blue on the face does not develop for some time and this one shows a green/brown color. I have just read on a BirdingNZ net forum that a large flock of Godwits was sighted in far north New Zealand on September 10 - the same day I first saw them for this season out at Inskip Point. The poster on this forum says the birds were sighted at the entrance to Rangaunu Harbour. This is especially interesting to me as Rangaunu Harbour was the first place I saw Godwits when I was a small child. My Dad took us out there and showed them to us and told us about their amazing migration. It's always easier when there are only a few birds in the photo. A flock of similar birds makes its easier again but also lets you see the different wing actions more easily. This is a small flock of Red-necked Stint. Pelicans really don't need studying for recognition but they are fun to watch. 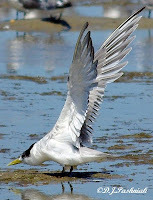 The most ungainly part of their flight is when they come in to land. As I was getting ready to leave I noticed a bird walking along the edge of the water by itself. I could not immediately recognize it so tried to get close enough for photos that I could crop at home. It was a Ruddy Turnstone - a bird I had not seen until now. I am told that they are occasionally seen here but only in ones or twos. This bird appeared to be by itself. It has two flags on one leg and a metal band high on the other leg. I have sent off a few emails to contact people today and have now been told that the flags identify it as having been flagged on King Island in Tasmania where the VWSG has been studying them for three years. Unfortunately the photo is too small and distant to see the number on the orange flag. The Godwits are back! After their epic journey non-stop from Alaska someone needs to celebrate! A few weeks ago some visitors from New Zealand told me that when the Godwits return to the Christchurch area the cathedral bells are rung. Nothing like that happens here, unfortunately, but maybe it should. I heard today that there have been 100,000 shorebirds lost from our flyway in just the last couple of years. This loss has happened because some very important roosting and feeding areas have been shut off from the sea and drained in Korea. If things like this keep happening then who knows how long we will see shorebirds returning each summer. Enough of the doom and gloom. Let me share what I saw this morning. I went out to Inskip Point and kayaked out to the sand island which is just off the point. There were huge flocks of shorebirds and seabirds roosting there. I have left all the photos larger than usual to try to give some idea of the size of the flocks. Click on all images. This is part of the flock of Bar-tailed Godwits. It's only the front birds that are easy to see but look at the legs to get some idea of how many are behind and out of sight. This is another part of the flock - again mainly Godwits but also quite a number of Eastern Curlews and quite large numbers of Great Knots. There were also some Curlew Sandpipers but not easily seen in this photo. There are always Pelicans out there but they were in even larger numbers than usual this morning. 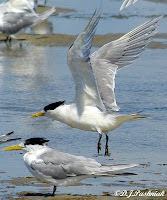 I have to put in a photo of part of the flock of Terns - mainly Crested, but some Caspian and Gull-billed also. Over the last week or so the army has been carrying out some kind of exercises which have included several low flying helicopters. They have been flying just above tree-top level and have passed over my house several times - very noisy! This morning they were operating on the western side of the Strait and although they were out of sight most of the time the noise across the water was horrible! When they came closest the birds all took off! Not good after their recent long flights down here! Here are a couple of photos of the main flock. I finished off the morning by talking to some visitors from East Gippsland who were out there with binos and scope. Yes, Of course they knew Duncan! (Ben Cruachen blog). It's a very small world! Breeding season is around Christmas/New Year and so most of these birds were still looking a bit scruffy in only partial breeding plumage. This one, however, was one of a few in nearly complete breeding plumage. 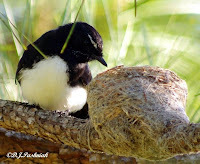 I often have Willie Wagtails in my yard and last year they nested in a gum tree across the road. This year they started showing a possessive interest in the big pine tree right next door so the other day I went and had a closer look. The nest was almost finished when I first looked. Yesterday I had another look and although they didn't seem worried about me wandering over there, they still don't seem to be spending full-time at the nest. I hope they do raise a nest-full of young and that I can photograph some of this over the next few weeks. Here's what I hope is the first of a series! Neither bird was at the nest when I first walked under the tree but one soon arrived, and then the second one.